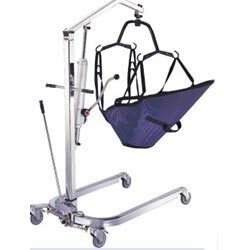 Our Hydraulic Patient Hoists have optimal use of the versatile functions of a standard hoist, such as lifting, transferring and moving of person's. They can be taken up directly from the wheelchair to the bath, bed, and or toilet, ideal for small rooms, bathrooms and narrow doors. Complete with sling and chain set. U-base adjustable from 48cm to 107cm. Mast height adjusts from 81cm to 2m.